This time of year my girls are outside a lot and when they go outside they have to come back in......over & over & over! I feel like I mop my floors more in the summer than the winter because the kids don't always think to take off their shoes if they even wore them outside. I just started using the Bona Mop for hardwood floors and it has made the task of getting my floors clean so much easier. The Bona Mop was very easy to put together. I love that the velcro pad is machine washable and the bottle is refillable. The trigger is very easy to use and the flow is very even and just the right amount of cleaning solution. My floors did not look streaked & they felt very clean to walk on. My girls are always with me so when it is time to clean we make a list of what needs to be done & we all pick what we want. 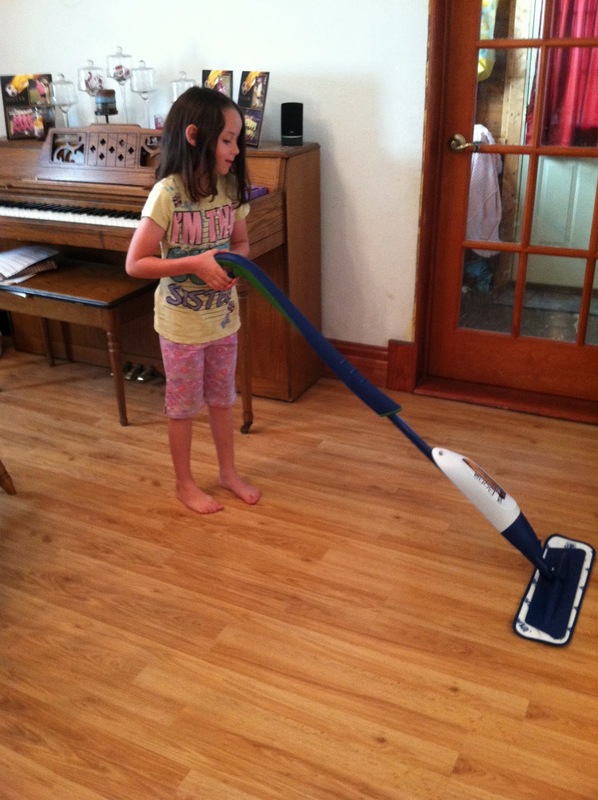 Mopping is always saved for last and my girls are always begging to do this job. Well......they don't usually do it very well & I always feel like I have to redo it. 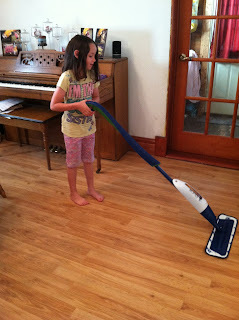 The Bona mop is so easy to use that my 7 year old did a great job on the floor. She has never been able to get the floor to look so good. I have one Bona Hardwood Floor Mop to giveaway. The lucky winner will get to choose the Stone, Tile, or Laminate Mop, whichever one is right for their floor. Disclaimer: I received a Bona Hardwood Floor Mop free of charge from Bona to use in my home. I received no other compensation and all opinions are my own. I have laminate and tile -- but dream of hardwood one day. We have laminate floors in our place. This looks like something my son could handle since he has a hard time coordinating his movements when helping me to clean up. we have laminate floors and carpet. We have carpet, tile, and hardwood! we have wood laminate, carpet and linoleum. laminate, wood , and carpet! Thank you!! We have laminate, carpet, and a little hardwood. We have mostly hardwood with a little laminate in the kitchen and tile in the bath. We have hardwood in all the living areas, including some bedrooms. And the rest are laminate. Thanks for the giveaway! I have hardwood floors in my house. We have a mixture of tile,wood and carpet in our home. Our floors are carpet in the main living areas/bedrooms, tile in the back entry and bathrooms and laminate in the front entry/kitchen and laundry room. I habe some carpeted rooms and some laminate flooring. Linoleum and lots of carpet. We have hardwood floors and arpt. We have hardwood, tile and carpet. We mostly have hardwood floors, with some ceramic tiles, vinyl tiles, carpeting and linoleum. Keeping them all clean is quite the challenge! We have a hardwood floor when a newer tile on top of it. We have laminate and carpet. I'm moving to a house with hardwood floors this summer.